आर्हेनियस: According to this definition developed by the Swedish chemist Svante Arrhenius, an acid is a substance that increases the concentration of hydrogen ions (H+), which are carried as hydronium ions (H3O+) when dissolved in water, while bases are substances that increase the concentration of hydroxide ions (OH-). This definition limits acids and bases to substances that can dissolve in water. Around 1800, many French chemists, including Antoine Lavoisier, incorrectly believed that all acids contained oxygen. Indeed the modern German word for oxygen is Sauerstoff (lit. sour substance), as is the Afrikaans word for oxygen suurstof, with the same meaning. English chemists, including Sir Humphry Davy, at the same time believed all acids contained hydrogen. Arrhenius used this belief to develop this definition of acid. ब्रोन्स्टेड-लौरी: According to this definition, an acid is a proton (hydrogen nucleus) donor and a base is a proton acceptor. The acid is said to be dissociated after the proton is donated. An acid and the corresponding base are referred to as conjugate acid-base pairs. Brønsted and Lowry independently formulated this definition, which includes water-insoluble substances not in the Arrhenius definition. Acids according to this definition are variously referred to as Brønsted acids, Brønsted-Lowry acids, proton acids, protic acids, or protonic acids. सल्भेण्ट-सिस्टम परिभाषा: According to this definition, an acid is a substance that, when dissolved in an autodissociating solvent, increases the concentration of the solvonium cations, such as H3O+ in water, NH4+ in liquid ammonia, NO+ in liquid N2O4, SbCl2+ in SbCl3, etc. Base is defined as the substance that increases the concentration of the solvate anions, respectively OH-, NH2-, NO3-, or SbCl4-. This definition extends acid-base reactions to non-aqueous systems and even some aprotic systems, where no hydrogen nuclei are involved in the reactions. This definition is not absolute, a compound acting as acid in one solvent may act as a base in another. लिवाइस: According to this definition developed by Gilbert N. Lewis, an acid is an electron-pair acceptor and a base is an electron-pair donor. (These are frequently referred to as "Lewis acids" and "Lewis bases," and are electrophiles and nucleophiles, respectively, in organic chemistry; Lewis bases are also ligands in coordination chemistry.) Lewis acids include substances with no transferable protons (ie H+ hydrogen ions), such as iron(III) chloride, and hence the Lewis definition of an acid has wider application than the Brønsted-Lowry definition. In fact, the term Lewis acid is often used to exclude protic (Brønsted-Lowry) acids. The Lewis definition can also be explained with molecular orbital theory. In general, an acid can receive an electron pair in its lowest unoccupied orbital (LUMO) from the highest occupied orbital (HOMO) of a base. That is, the HOMO from the base and the LUMO from the acid combine to a bonding molecular orbital. Acids are/can be gases, liquids, or solids. 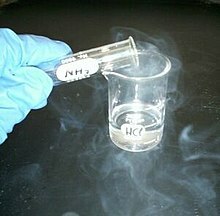 Respective examples (at 20 °C and 1 atm) are hydrogen chloride, sulfuric acid and citric acid. Solutions of acids in water are liquids, such as hydrochloric acid - an aqueous solution of hydrogen chloride. At 20 °C and 1 atm, linear carboxylic acids are liquids up to nonanoic acid (nine carbon atoms) and solids beginning from decanoic acid (ten carbon atoms). Aromatic carboxylic acids, the simplest being benzoic acid, are solids. Strong acids and many concentrated acids, being corrosive, can be dangerous; causing severe burns for even minor contact. Generally, acid burns on the skin are treated by rinsing the affected area abundantly with running water, followed up with immediate medical attention. In the case of highly concentrated mineral acids such as sulfuric acid or nitric acid, the acid should first be wiped off, otherwise the exothermic mixing of the acid and the water could cause thermal burns. [पुष्टि(साइटेसन) मागु] Particular acids may also be dangerous for reasons not related to their acidity. Material Safety Data Sheets (MSDS) can be consulted for detailed information on dangers and handling instructions. क्लासिकल नामाकरणय् अम्लतेत इमिगु एनायन कथं नां बियातै। That ionic suffix is dropped and replaced with a new suffix (and sometimes prefix), according to the table below. For example, HCl has chloride as its anion, so the -ide suffix makes it take the form hydrochloric acid. In the IUPAC naming system, "aqueous" is simply added to the name of the ionic compound. Thus, for hydrogen chloride, the IUPAC name would be aqueous hydrogen chloride. The prefix "hydro-" is added only if the acid is made up of just hydrogen and one other element. This page was last edited on ६ अप्रिल २०१७, at २०:०९.